With collections inspired by Ancient Jerusalem, taking influence from the Rain Forest, Kensington, and the Basaltina Stone Project may seem out of the box for a tile company, yet is well within the bounds of the next generation Lea Ceramiche company. Think of Lea Ceramiche as your impossibly hip and in the know bestie: always knows about the latest technology and the trendiest fashions while no doubt balancing a promotion at work and at least two children under the age of five. Lea Ceramiche tiles are for those discerning individuals who want it all – right down to the floors under their feet. The looks, the brawn and the prestige are hard to find in a life partner, but thanks to Lea Ceramiche these characteristics are now the standard in flooring. When was the last time you were able to say that you set the bar, eh? To beat out the competition you have to go above and beyond in innovative ways and you also have to show that you care about your clients. 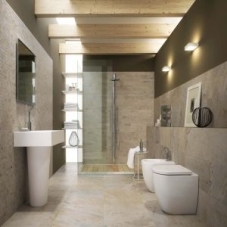 Lea Ceramiche is partnering up with Microban, the world leader in antibacterial technology. Not only have they made tiles squeaky clean, but they have also been busy patenting their Slimtech technology, a geektastic laminating and porcelain compacting process that makes slabs of laminated porcelain available to the public in record sizes (300cm x 100cm) due to extraordinary lightness resulting from a thickness of only 3mm. Like all the latest smartphones and vacuum cleaners, slimmer is better and now Lea Ceramiche has got it. They work with personal and commercial spaces ranging from bars called pubs to shopping malls, and they are even presenting an installation at this year’s Milan Design Week titled Urban and Domestic Landscapes so you know they won’t mix Wendy’s and Sotheby’s. Their products are perfect for interiors and exteriors, and they have recently branched out into eco-wood tiles – see what we did there? Lea Ceramiche doesn’t just mess with boot treads and pilled, mismatched socks, but are also adept in stoneware wall tiles that are virtual chameleons: able to adapt to the most unusual surfaces and an ample range of decors.